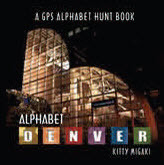 Alphabet Chicago is a GPS alphabet hunt book by Kitty Migaki. This 64-page full color hardcover book is suitable for K – 5, but like Alphabet Denver, provides a fun activity that families across the generations can enjoy. The book captures the ABCs in downtown Chicago architecture, and combines it with fun poetry and the longitude and latitude of each letter location so readers can go on a letter hunt! Shipping in September, email the author for details.